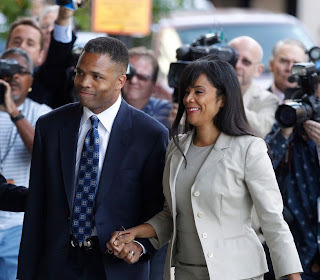 The Urban Politico: Possible Presidential Pardon for Wife of Jesse Jackson, Jr. There may be some good news at last for ex-Chicago Ald. Sandi Jackson, wife of disgraced Congressman Jesse Jackson Jr.
"The hottest rumor to come down the political pike: Speculation President Barack Obama may pardon former Ald. Sandi Jackson before he leaves office in January 2017," Sun-Times political reporter Michael Sneed said Monday. The couple was sentenced to prison time in August after pleading guilty using some $750,000 in campaign funds for lavish and often bizarre personal expenses. The former congressman was sentenced to 30 months of jail time for his illegal spending while his wife was sentenced to one year for filing false tax returns. Jackson Jr. begins his prison term Nov. 1. Sandi Jackson's lawyers were able to get an order from the judge allowing her to remain free to care for the couple's young children until her husband completes his term. In his combined terms as president, Obama has pardoned 39 people, most recently granting clemency to 17 felons convicted of non-violent offenses this past March.According an analysis from ProPublica, Obama has granted clemency at a lower rate than any other president in modern history. If Obama were to grant Sandi Jackson a pardon when he leaves office, the Sun-Times notes she will have already served half of her sentence. It's certainly within his power to do so, but should the President pardon Sandi Jackson? While we're at it, what about Jesse Jackson, Jr.? They were, after all, essentially convicted for the same scheme. I, for one, can certainly think of some people convicted by the federal government who definitely deserve to be put on the Presidential Pardon list (see these 6 guys in Colorado (5 black, 1 white) known as the "IRP 6" who were essentially convicted because their start up company -- an IT company that created software to help law enforcement -- went into debt...which, last time I checked, is what just about every business in America does. We'll do a post on their story next week).